Ok, so I know everyone finished their teacher toolboxes like forever and a half ago–but I wasn’t really planning on decorating mine. You see, I am notoriously bad at spray painting. I really prefer to make everything on the computer…it comes out neat and clean and I can undo anything I don’t like. But I kept seeing these beautifully decorated teacher toolboxes EVERYWHERE I went…the blogs, Pinterest, Monday Made It. I couldn’t escape the call to decorate it! So I decided to keep it simple: black and white to go with my color scheme. And I like seeing a bit of the content in the drawers, so I thought I would just decorate the little handles (this was the fun part!). In the midst of all this, I vowed to actually spraypaint the box the right way. You know, a light coat first, then another one (following the directions on the can of how long to wait in between coats). And I did it! I painted three coats and it looked PERFECT! I was so, so proud of myself. I bragged to everyone within range about my painting skills. That evening, I hauled my little white toolbox inside. It was still a bit tacky, but I really wanted to put the drawers inside. So I tried the first drawer. It wouldn’t fit in the box. I tried again and again. I thought, “maybe it’s still too tacky.” But I knew something wasn’t right. Well, after a few more tries (please don’t laugh at me!) I figured it out. It was upside down. I had painted it the wrong way. This wouldn’t be a problem, except the bottom (or top, so perhaps I should say “the bottom in Kristen’s world”) had adhered to the newspaper and had various bits of articles stuck all over it. This hadn’t bothered me before, but now this had to be the top!! So, instead of waiting until the next day like a rational person, I rushed outside to finish it. But it was all too late. The sun was slipping behind the trees. The mosquitoes were converging. Various bits of plant life were blowing in the breeze and adhering instantly to the toolbox. Suddenly, my old, familiar, impatient techniques had kicked in. Within 3 minutes, the entire thing was soaked and dripping and making those weird spider-webby things that always seem to happen to me when I spray paint (except in my perfect upside-down paint job this morning, of course). So. It is what it is. From far away, it looks alright and matches my room. Up close is another story. Let it be known, this is the day I have sworn off spray paint for good. It’s all contact paper and hot glue from now on! Thank you Tara, I never would have had the guts to even make this if it weren’t for your linky party!!! Post Your Pet(s) Linky Party! An updated free file and a new store! Kristen, we have the same painting affliction!!!! I hate and have little patience for it too! I love the little black labels and may actually do this now!!! Thanks for sharing! It looks adorable! Thanks Mandy! That's the problem for sure with me–lack of patience!! Haha! I am the same way! I want it done then and won't be patient enough to wait for the next day. I love your labels. Thanks for sharing Kristen! Kristen..do you use your regular printer to print out all of these black labels? I run out of black ink ALL the time and I have a hard time printing so much black! 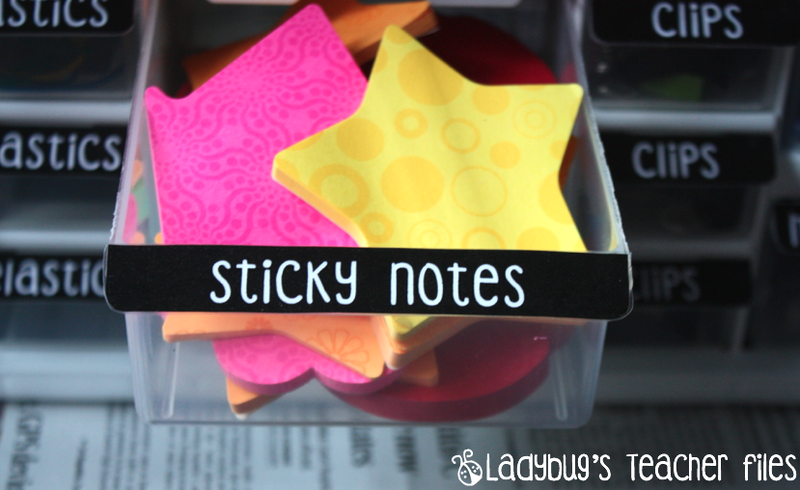 But these are so cute, and I like the simplicity of just hot gluing them on! Just curious, where do you find the best value on ink? Do you use the Cartridge World refill service? Love this! I have redone mine a few times because I don't like the paper I keep choosing 🙂 This is the perfect solution! I love how your toolbox turned out! What font did you use? I have some signs I need to make for outside my classroom door, and I love the look of the one you used. Hi Mel, thanks! It's coffeshop expresso (or coffehouse expresso, but I know it's expresso) from Sweet Shoppe Designs. It's my fave!!! Oh this made me laugh!! This could so happen to me. I hope you laughed a bit. 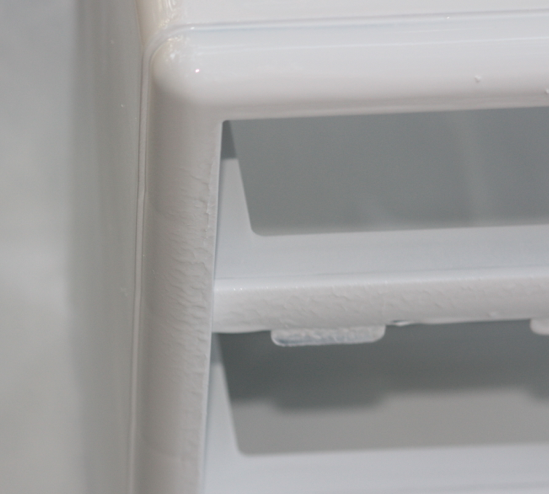 I tried spray painting for the first time on some white plastic drawers I had. I have NO patience either. I had dripping paint and bugs landing on it! I LOVE the tags, I've been waiting to tackle this project due to the rumor I've heard that the pencils and pencs don't go straight in the drawer. Is this true?? Kristen – Thanks for posting this! 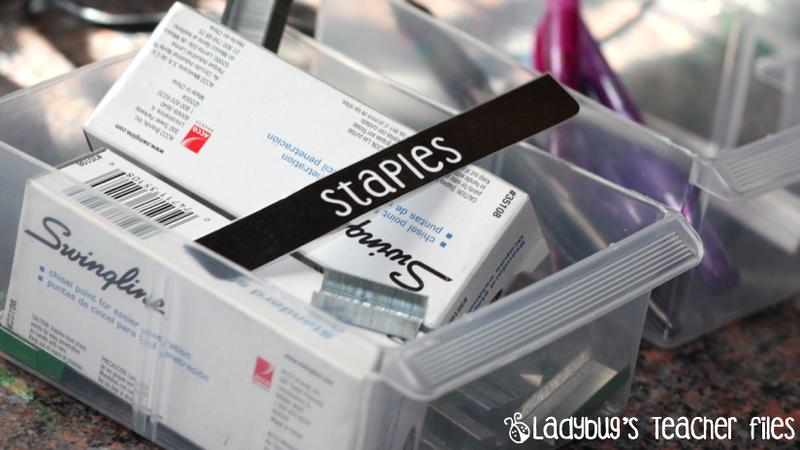 After seeing how cute your drawers came out, I added a stop at Lowe's to my errand list for tomorrow! I have the same problem with painting though – I may just leave mine blue! Thanks for sharing the labels!!! Seriously! I just finish mine this week and then you post your idea and make me want to redo the whole thing for a second time! Honestly…I should just make a point of only creating what you create so I don't go through this again! Yours is lovely! I have the same painting problem!! I spray painted some really cute tin pails and they have drips all over! 🙁 But most of them have at least one good side! Thanks for sharing the printable! 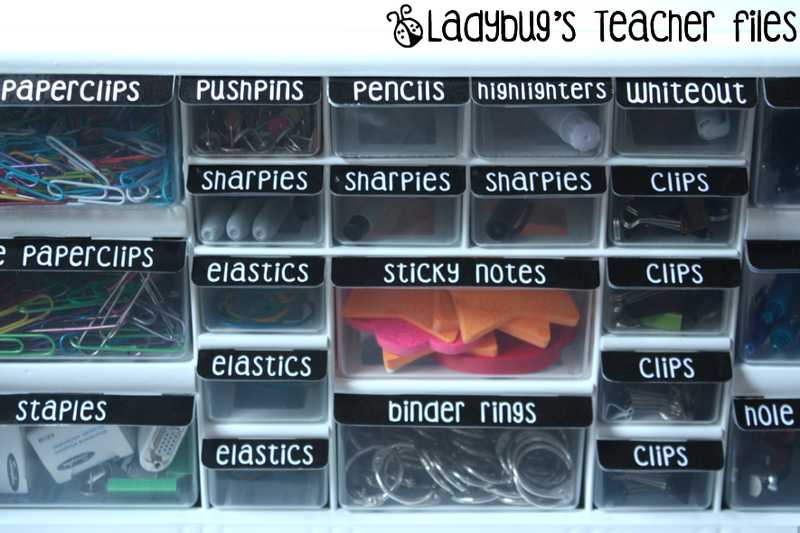 I have the same organizer- no spray paint though- I put scrapbook papers in each drawer to fancy it up. 🙂 Anyway, I've been looking for some printables for it since I made it several months ago! Kristen, I love the clean. neat simplicity of your white on black handle labels-and I have that font too-love it! I Love this tool box!!! I just found your blog tonight and was wondering where you found the tool box!! Thanks! It's from Lowe's, there's a green link at the end of the article to the box. Very neat labels. I'm the world's worst spray painter. I usually have more on me than the piece I'm spraying. I just spent over $100 on spray paint and now hate the shelves that I sprayed. I'm definitely with you. I seriously need to stop trying. My intent was to say that I also suffered from the spray painting blues but after reading all of the above comments, I'm beginning to think it's not us. It must be the paint if we all have the same problem! As always, I love what you made. It looks fantastic. Thanks for sharing again! PS… Do you know how to leave a blog signature from an iPad? I've tried the HTML code but it never works…. I feel your angst at spray painting. I really try to stay away from a spray paint can as I tend to make a HUGE mess. That is one of the reasons I haven't done this tool box yet…at least that is what I keep telling myself! But I really love your labels……so maybe this weekend, I will make me one, too! Surely I can get someone with more spray paint expertise to take care of that little tidbit for me! So I just bought a box (a few weeks ago) almost identical to this, and labels were on my to do list. THANK YOU for sharing…. this just saved me a ton of time! Two of my best friends went together and made me one of these for my 22nd birthday. I absolutely adore it!!! Thanks for a great idea and a whole page full of chuckles! Believe it or not, I just came across your amazing blog! I am now your newest follower. You have some really awesome posts! I love your blog! Thank you so much for sharing so many great resources. I have been using a lot of your printables in my own classroom. Do you happen to have any signs for a focus wall? Thank you so much for all your hard work! I don't currently, I'm sorry Lauren. Thanks for the nice message! Is it ok that I laughed while reading this post?! You are a good sport! And, hey, I have not attempted this project (yet). While I still have a few days free, I think I'll head to Lowe's. Thanks for the printable! Yes, don't worry Chrissy–I am laughing at myself about it now! I REALLY like the way you did yours with just labeled "handles". If I only had a place for one of these tool boxes. That is TOTALLY what would happen to me! I love that you told us because without the close-up pick we would never have known. UGh.. this is so me. I get so excited about something and this happens. 🙂 Oh well.. Love the labels, many thanks for sharing with us. BTW… what font is that? I know I have it, but can't seem to figure out which one it is. Would someone please explain to me how to type in this document? I downloaded it but I can't click in the label area. Obviously, I don't use ppt much! Thanks for any help you can provide! Sure, you go to Insert, then select Text Box. You can type whatever you'd like for a label, change the font color, and just drag it over the black premade labels. I hope this helps!! Where did you get the bins/boxes??? Thanks! LOVE.IT. I wanted to do something with mine without all of the visual distractions of the color. This is PERFECT!! Thanks so very much!! Where did you get your box from? From Lowe's, there's a green link at the end of the post that shows the box. Thanks! It looks more expensive than it really is. 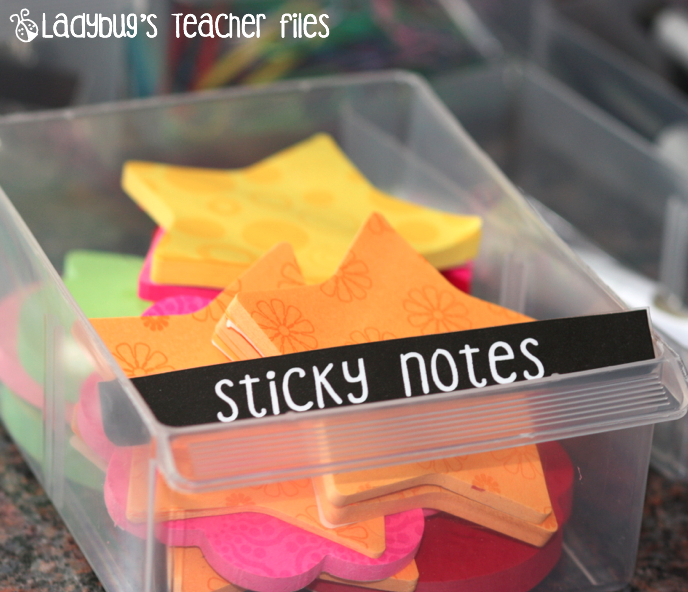 It's great to think outside of the box instead of buying everything in teacher stores. It's too expensive. You are too funny and I can totally relate! I bought my toolbox but it is still sitting on my kitchen table because I have a fear of spray paint mixed with impatience! Thanks for the labels! These are a great option! Your blog looks awesome! I am currently a SAHM, but I would love to get back into teaching. My children are entering 5th grade, and I feel ready to get back into the education field. I would love to pin some of your ideas onto some of my Pinterest boards just in case I do become a teacher again. I also noticed that you actually answer questions that people ask on your blog. I think that's so sweet of you to do! I do not see a "share with Pinterest" button, so I want to get the "okay" with you to copy and paste. (I, of course, would give you all the credit for your ideas. Oh, I should probably put one of those up, huh? Thanks for the reminder Joy and for the wonderful message. I would be delighted if you pinned anything from my blog! Best of luck in the future!! Hi again! Thanks for your prompt reply Kristen! I actually stumbled upon your site because I saw a pin that someone had on a board that came from your site. I am glad that you don't mind if I make pins from some of your ideas. Thanks again for sharing such great ideas with others! Oh… it's me again! I'm sorry to bother you, but I just tried to pin your teacher toolbox idea and the wrong image appeared. I tried a few times, but eventually gave up on pinning it. LOL, how funny!!!! Glad you got it figured out!! (And this is why my husband painted my toolbox, NOT me!) Love what did with the labels! The font is adorable, too. I love your toolbox! I really like how your put the labels on the handles. It makes it easier to read them I think! Thanks for sharing! Hi Kristen – Could you please post instructions on how to type on the file you made with the black labels. And – I went to the sweetsshop website and purchased the font you mentioned, but I am not understanding how to access it now on my computer – can you give any words of advice? Hi Marne! If you make a text box and type the font you'd like and change the color, you can then drag it over the graphic. I painted two of them (two different sizes) that I got yesterday with spray paint, along with two bookcases I had sitting around in our spare bedroom. I am glad I am not the only one who can't use spray paint the correct way. I was too impatient. Thanks for the free labels, I was just about to make some. Hi! I love your toolbox and had just started to make mine yesterday. I wasn't sure how I wanted to label them so I was so excited when I found yours!!! Thanks for sharing!!! One question … Did you just tape them on? This looks great, Kristen! I am thrilled to have found your site!!! Is there a way to change the label color? Instead of black, I would love to use a purple color to coordinate with my room. Please let me know if you have a minute. Thanks so very, very much! So nice of you to share this, but I also can't get them to download. Sorry to ask but can you also email me the file? ( dinat102@aol.com ) Thank you so much for taking the time to do it. Thanks for sharing all your fabulous ideas! These are gorgeous. I just bought the font because I want to make these for my house and they need to look exactly like yours…and they will because I'm the cruddiest spray painter ever. ZERO patience for the stuff. Thanks for sharing. It looks beautiful, but you have scared me off spray painting. I am pinning this though, in-case I get brave and or bored. I don't have the patience for things like that. I want my file cabinets to match my decor and I am just going to buy new ones! I just picture a disaster if I try to paint them black. Very Cute! Could you tell me how (specifically) to change the font color and style. I only get "format" and that only changes the whole text box. I can't find anything else that says font style and color on PP. Thanks a million! Where did you get you 'toolbox;? From Lowes…the green link at the end of the post will take you to the box. I can SO relate! I HATE spray paint, but sometimes its the only option! I painted some frames and put scrapbook paper in them (a cheaper version of those expensive square grouping of 9 pictures)and had done a good job on the first coat, but being impatient, I had to do the second coat before they were completely dry… Disaster! Drip marks, those "spiderwebs" as you called them… I was so mad at myself!! They turned out imperfect, but I still hung them up! They're like me — imperfect but still nice to have around!! 🙂 hehe! THANK YOU so much for the labels! I love the simplicity, and the fact that you can still see what is inside! !